A bit late in noticing this one, but I was sorry to see that, after 5 years, Lee over at Blood & Mud has decided to call it quits and close his excellent blog. Entertaining, witty and informative is a difficult combination to pull off (I should know - I’ve been trying and failing for some time now) but Blood & Mud managed it with enviable regularity. 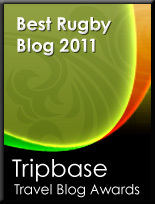 I fully understand how pressures on time can lead to dwindling output but it’s a shame nevertheless and Lee’s unique contribution to the rugby blogosphere will definitely be missed. A good blog that will be missed. I gotta get on my horse and increase my output, I have been sporadic at best the past year.